The national museum of Turkmen carpet was created in Ashkhabad by presidential decree in 1993.The museum was opened in order to recreate and preserve the national traditions of Turkmen carpet-weaving and also for carpet popularization of Turkmenistan. It was designed for the collection of the best samples of carpet art,study,restoration and farther development of a manual carpet-weaving.Now the.Now the museum has up to 8000 different exhibits,the smallest carpet is 0,01 sq.metre and that which is considered as the biggest one in the world is 301 sq.metre,entered the Guiness Book of Records in 2003. There are also silk carpets in the museum which were woven by skilled craftsmen 3-4 centuries ago. 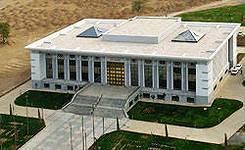 The National museum of Turkmen carpet is one of the cultural centers in Turkmenistan.In addition to the above-mentioned the museum has rarities of woven carpets.It is not only an exhibition of carpets but also the biggest hall restoration of ancient samples in the country.